Take a walk through the beautiful streets of Savannah GA. The city radiates a charm that few can match. It’s a popular tourist destination with roughly 13 million visitors each year. Tour choices are endless and range from trolley tours all the way to ghost tours. With the wide range of sites and all the historical information to read at each one, tourists without guidance are not properly served. However, following along a guide or listening to an audio tour can be a bit of a snooze. How can this change? Touchpoint! TouchPoint is a mobile application that uses augmented reality to enhance the many walking tours that Morris Communications has to offer. Touchpoint currently focuses in Savannah. For those who are unfamiliar, augmented reality is a technology that allows users to see and interact with virtual objects that are overlaid on their physical environment. Created for both iOS and Android devices, the primary framework of the app was created with Shoutem, an app-building software. We also used Unity, FBX models, Vuforia. Unity is a cross-platform game engine that is typically used for developing video games. FBX or Filmbox is simply a file format. Vuforia is an augmented reality software development kit that recognizes and tracks planar images and 3D objects. With the pairing of these three, we could position and orient our 3D models in relation to real world landmarks. When these landmarks are viewed through the camera of a mobile device the 3D model appears as part of the real world scene. Ideally, all this will be integrated to the Shoutem framework to create one seamless application. 1. Tourists download the app and select tour of choice. A defining feature of Touchpoint is that all of its tours are self guided, walking tours. This means the stops on each tour are fairly close together, and each tour spans only a couple of streets to keep everything within walking distance. 2. With the app open and tour selected, tourists walk the route which is displayed on the map. 3. 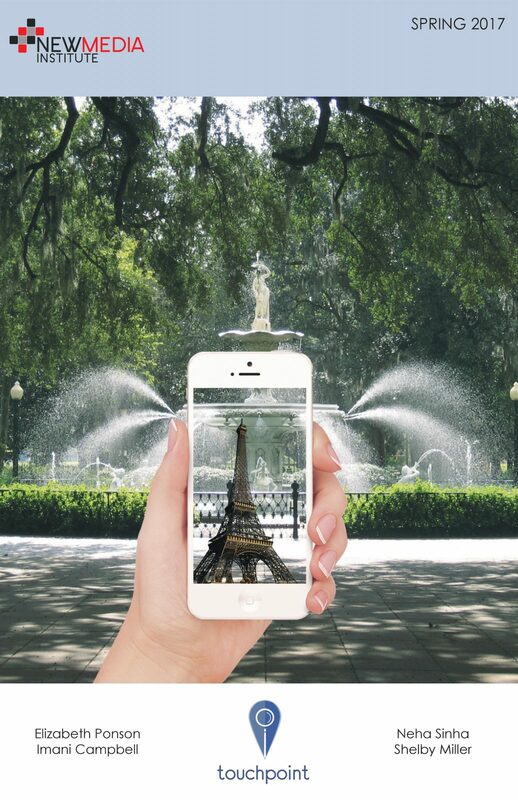 At each site, tourists can then use Touchpoint to scan specific markers, for example physical landmarks, resulting in the appearance of a 3D model. In the future, audio could be added to further amplify the experience.